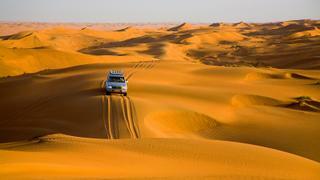 The Wahiba sand dunes in Oman. Picture courtesy of Creative Comments. 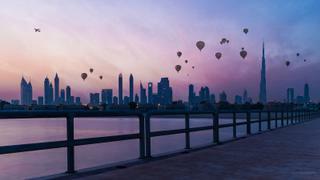 Dubai's unique skyline. Picture courtesy of Creative Comments. 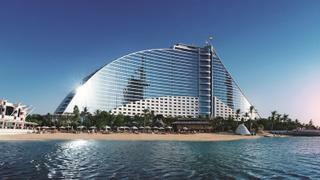 Visitors can enjoy a more authentic Middle East experience in Abu Dhabi. Picture courtesy of Creative Comments. Abu Dhabi's Louvre Museum opened in November 2017 Picture courtesy of Creative Comments. A land of rugged mountain ranges, rolling deserts and aquamarine seas, Oman has a charisma born of achingly romantic natural phenomena. The sultanate may share a border with the UAE but its rich heritage, friendly culture and a topography reminiscent of Mars give it a very different feel. Sultan Qaboos of Oman is well aware of the country’s beauty from the water – he owns 155 metre Al Said, moored in Muscat’s Port Sultan Qaboos. But superyachts are only just starting to explore its wild charms – recent visitors include 53.6 metre explorer yacht Itasca and 119 metre MotorYachtA. 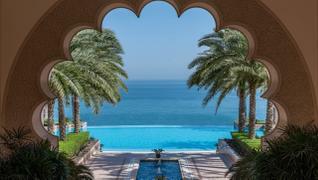 With a rich maritime heritage, Oman is the favourite sailing destination in the Arabian Gulf,” says Firas Matraji, CEO of Barr Al Jissah resort, which is home to the Al Mina Marina. “The sultanate’s coastline stretches for 1,700 kilometres and has established itself as a regular destination on the global sailing route.” This status was confirmed when it became the first country in the Middle East to host the America’s Cup World Series in 2016. 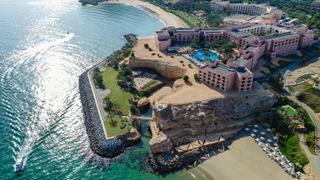 Carved into the coastline just north of Muscat, Barr Al Jissah is hoping to capitalise on the increase of both sailing and motor yacht visitors and a private yacht club is under construction. With the ability to accommodate yachts of any size within the marina and its protected bay, the site is also home to three Shangri-La hotels, has 22 dining options and the first L’Occitane Spa in the region. Further north, the Musandam peninsula offers fjord scenery that rivals Norway’s, with mountains rising directly from the sea to more than 2,000 metres. The strategic location of its natural harbour means it has been a trading hub with Persia, India, Africa and the wider world for centuries and its waters are still home to traditional wooden dhows. As well as its marine offering, Oman’s landscapes afford plenty of thrilling inland adventures – including getting a taste of the Bedouin lifestyle or “dune bashing” (a rollercoaster ride in SUVs across the moving desert terrain) in the Wahiba Sands and an incredible range of hiking in the Al Hajar Mountains. Jebel Shams, Oman’s highest mountain, is famed for its view of the Wadi Ghul, known as the Grand Canyon of Oman. Accessible by 4x4 you can hike the Balcony Walk, which takes approximately three hours, for the most stunning views. Itani credits this influx to events such as the Dubai International Boat Show, but also to ongoing improvements in infrastructure – including Dubai Harbour, which will be the largest marina in the Middle East and North Africa region upon completion. Captain Graeme Hampson of 73 metre Titania is equally impressed with its superyacht credentials. “What surprised me most about Dubai as a destination is the fact that it has first-class marinas and a host of onshore activities that can cater to anyone’s taste,” he says. Superyachts might be relatively new to the party but Dubai’s luxury hotel offering is second to none – led, of course, by Dubai Holding’s Jumeirah Group. The 321 metre tall Burj Al Arab, which resembles the sail of a ship, is a symbol of modern Dubai. Situated on an artificial island it is connected by a bridge back to the mainland and its nearest neighbour is, conveniently, the Jumeirah Beach Hotel Marina. The hotel is the ultimate place not just to relax, but to be seen to relax, so take the lift up from its golden atrium to the opulent Talise Spa on its 18th floor. At more than 150 metres up, its glass-fronted treatment rooms offer views of jet skis doing donuts in the bay below. Opt for the two-hour wave treatment, which consists of rub, massage and warming wrap treatment that will leave you feeling ready to take on anything that Dubai has to throw at you. If you fancy some time on shore there are plenty of hotel rooms to rival any master cabin, such as the Malakiya Villas located within the waterways of Jumeirah’s Madinat property. 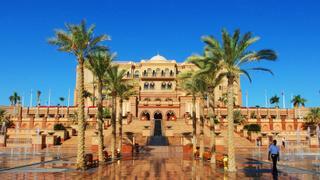 Inspired by the courtyard summer houses of old Arabia they have a 24-hour butler service and private plunge pools. The hotel itself may not be as tall as the Burj Al Arab but it is just as glamorous, with statues of golden prancing horses, crystal chandeliers and glittering vases overflowing with fresh flowers. 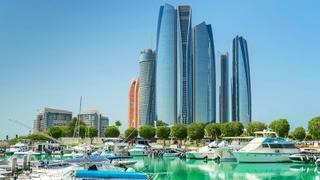 Abu Dhabi is more down to earth than Dubai – both literally (it has fewer skyscrapers and more green spaces) and in its attitude – and this has a certain allure for visitors. “As Abu Dhabi has further established itself as a destination, yacht owners have begun to turn to it over other destinations in the region, seeking a slightly quieter pace of life and a more authentic Middle East experience,” says Saeed Al Dhaheri, from Abu Dhabi’s Department of Culture and Tourism. 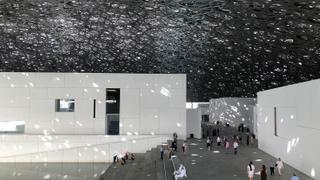 The biggest new string to the emirate’s bow is the Louvre Abu Dhabi, which opened in November. Located in the Saadiyat Island Cultural District, it is the largest art museum in the Arabian Peninsula, consisting of 50 white stone buildings, housing 23 galleries holding 600 works of art. This September, Leonardo da Vinci’s Salvator Mundi, the world’s most expensive painting, will be added to the display. “Bringing the Louvre brand to Abu Dhabi was our first big step towards placing the emirate on the cultural map and marks the beginning of our journey which will see the Guggenheim and Zayed National Museum open in future years,” says Al Dhaheri. As well as the Louvre, the other draw for superyachts has been the addition of the Abu Dhabi Grand Prix to the Formula One calendar. Centred around Yas Marina, which can accommodate boats up to 150 metres, yachts attending have included 72 metre Serenity, 77 metre Silver Fast and 69.1 metre Saluzi. Visitors wanting to be closer to the city centre can make use of Zayed Port and moor next to the largest superyacht in the world, Azzam. At the other end of the pedestrianised cornice, the Etihad Towers are a modern landmark within walking distance of sprawling Presidential Palace. For the best view of its manicured lawns and endless domes – and, in fact, the entire city – head to the Observation Deck at 300. Located on the 74th floor, it provides 360-degree views and serves a traditional high tea, which is best enjoyed at sunset. If you are looking for something more substantial then Ray’s Grill, in the opposing tower, is a meat lover’s paradise with a choice of cattle from producers in Australia, New Zealand, Italy, Ireland, Argentina and the US. There is also a gin trolley mixologist and a mustard connoisseur to suggest the perfect accompaniment, and the blue cheese broccoli side dish is enough to persuade anyone to eat vegetables. Those seeking a less frenetic vibe should head out to Saadiyat Island, where Jumeirah’s latest hotel is set to open this November. With a nine- kilometre sparkling white beach that would rival any in the Caribbean, it’s a breeding ground for hawksbill sea turtles, and the beach has to be accessed via pedestrian walkways to prevent any chance of them being disturbed.